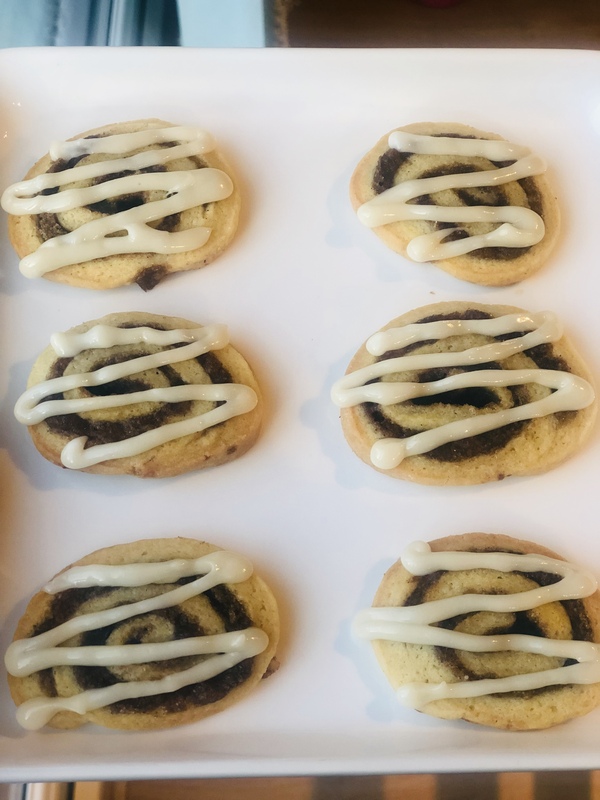 These cookies are the perfect way to get your cinnamon bun ‘fix’ without any hassle of yeast or proving times. Simple, quick and a great recipe to get the kids involved with too! 1) In the bowl of a stand mixer, cream together the butter and caster sugar until light and fluffy. 2) Add in the vanilla and egg and mix. 3) In a separate bowl mix together the flour and baking powder and then add half of this bowl to the stand mixer ingredients and mix on a low speed. 4) Add the rest of the flour and baking powder and turn up the speed of the stand mixer until you have a soft sticky dough. 5) Empty the dough onto a floured surface. Make sure that it doesn’t stick to the surface at all. 6) Roll the dough into a rectangle with the dough about the thickness of a £1 coin. 7) Dot the top of the dough with small chunks of butter and carefully spread it. 8) In a small bowl mix together the two sugars and the ground cinnamon and sprinkle this over the top of the butter. Use the back of a spoon to push it into the dough. 9) Roll the dough (lengthwise not width wise) until you end up with a rolled log of dough. You may need to seal the end with some milk – either using a small pastry brush or your finger. 10) Leave the dough to firm up in the fridge for at least an hour. 11) 15 minutes before you need to take the dough out of the fridge, preheat the oven to170. 12) Remove the dough from the fridge, trim the ends and then slice into cookies. (I find the easiest way is if you cut the log roll in half and then cut each half in half again, then quarters, then each quarter into 4 cookies. 13) Bake the cookies in batches for 8-10 minutes until lightly golden brown. Leave to cool for 2 minutes on the tray before cooling fully on a wire rack. 14) Once fully cool, mix together the icing sugar, cream cheese and vanilla in a bowl until you have a thick frosting. (If you need to loosen it you can add a drop of milk). 15) Spoon the frosting into a piping bag or zip lock bag with one corner snipped off and pipe thin zigzag lines across the cookies. Store these biscuits at room temperature in a parchment lined air tight container for up to 3 days.